The 2006 Jacksonville Jaguars season was the 12th season for the team in the National Football League. 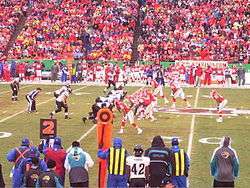 The Jaguars failed to improve on their 12–4 record from 2005, and missed the playoffs. With the win, the Jaguars started their season 1–0. JAC – Josh Scobee 31 yard field goal, Jaguars 3–0. Drive: 11 plays, 60 yards, 5:29. JAC – Josh Scobee 32 yard field goal, Jaguars 6–0. Drive: 10 plays, 78 yards, 4:21. JAC – Josh Scobee 42 yard field goal, Jaguars 9–0. Drive: 4 plays, 5 yards, 0:27. With the win, the Jaguars improved to 2–0. With the loss, the Jaguars fell to 2–1. With the loss, the Jaguars fell to 2–2. With the win, the Jaguars went into their bye week at 3–2. With the loss, the Jaguars fell to 3–3. With the win, the Jaguars improved to 4–3. With the win, the Jaguars improved to 5–3. With the loss, the Jaguars fell to 5–4. With the win, the Jaguars improved to 6–4. With the loss, the Jaguars fell to 6–5. With the win, the Jaguars improved to 7–5. During this game, the Jaguars combined for 375 rushing yards, the second-most in a single game since the AFL–NFL merger. Maurice Jones-Drew had a franchise-record 302 all-purpose yards; 166 rushing yards with two touchdowns, 15 receiving yards, and 121 return yards with a kickoff return touchdown. Fred Taylor had 131 rushing yards with one touchdown. With the win, the Jaguars improved to 8–5. With the loss, the Jaguars fell to 8–6. With the loss, the Jaguars fell to 8–7. With the loss, the Jaguars ended their season 8–8. ↑ "Jaguars Preseason Schedule". Retrieved 2008-12-31. ↑ "Jaguars Regular Season Schedule". Retrieved 2008-12-31.